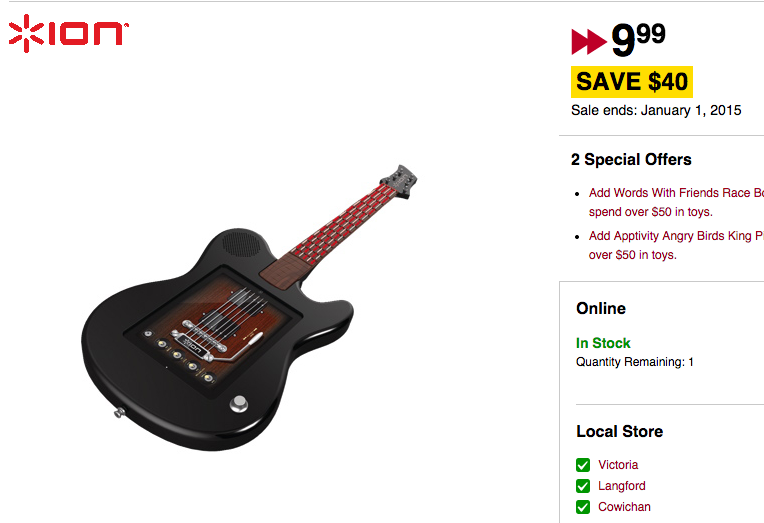 Future Shop and Best Buy have the ION All-Star Full Size Guitar Controller for your iPhone, iPad or iPod touch on clearance for $9.99—it normally is priced at $49.99. Built-in speaker with volume control – rock out anywhere! Since this product is a couple years old, it will only work for the iPhone 4/4S and iPad 2 and iPad 3 (devices with 30-pin connectors). If you have an older iOS device hanging around, this might be fun to try out for $10. It’s showing as available both online and in-stores, with the sale going until January 1, 2015. Let us know if you’re going to jump on this.